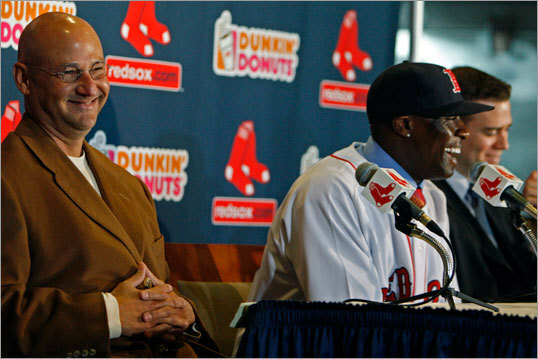 Red Sox manager Terry Francona (left) often says that he doesn't have to fill out lineup cards in January. He's right. But with Mike Cameron (center), Adrian Beltre, Marco Scutaro in the fold -- not to mention the addition of John Lackey to the pitching staff --- we're getting a better sense of how that lineup might look a few months from now come Opening Day. The Red Sox look like a terrific defensive team with deep pitching, and the lineup could be quite good even with the departure of Jason Bay. Here is a closer look at the lineup, the defense, and the even the starting pitching. Players are presented in the probable batting order.